Proper roof ventilation allows the heat in your attic to escape. This is important for increasing the longevity of your roof as well as reducing your energy costs. Ice damming is a common occurrence in winter when heat from the attic melts snow on your roof that refreezes, causes water to back-up and damage to your roofing system. 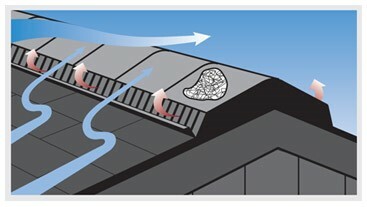 Proper ventilation helps the warm air escape before it has a chance to melt the snow and ice on your roof. Ventilation also benefits a roof when it’s hot outside allowing heat to escape instead of damaging your shingles from the inside out. Once your roof is adequately vented, your home will feel more comfortable year round and your air conditioner won’t need to work as hard in the summer. Ridge vents are the most common type of exhaust vent and are installed on the ridge or peak of your roof. We recommend the ShingleVent II which has a low profile, shingle-over design to blend in with the roof. Once installed, it provides exceptional attic ventilation and is almost invisible from the ground. How do Ridge Vents work? The external wind baffle directs airflow up and over the vent, creating an area of low pressure over the vent openings, pulling air out of the attic. It also deflects rain and snow over the vent, protecting the roof and attic space from weather infiltration. An internal weather filter helps to trap fine snow before it enters the attic and protects against dust and insect intrusion. This video demonstrates the effective ridge vent ventilation of heat and moisture using the Bernoulli Effect. Start your project the right way and keep your roofing system working great. Schedule an appointment with A&D Exteriors to get your FREE estimate, or send us a message and let us know what you’re looking to get done!